At the paternal family farm, there were my teetotaling great-grandparents living in their crackerbox house, where they had eked out a sort of a living. They were German and Norwegian and Lutheran. Everything smelled like old people and dust. My paternal great-grandfather managed to buy a place where, during the Depression, they could shoot possums and raccoons when they got hungry. The maternal family farm is a spanking newly remodeled place, with a freshly decorated house and three semis parked out front. These great-grandparents were Polish and Bohemian and Catholic. My great-grandfather had to sell his saloon because of Prohibition, but he had made enough money to buy a big piece of land, and continued, allegedly, to supplement his income with alcohol sales once he was on the farm. This is, obviously, a lesson on the benefits of alcohol. My other two sets of great-grandparents were not farmers. They were, respectively, a mortician and a shop owner turned preacher. We do not go back to John A. Gentleman Funeral Home unless someone dies. Once part of a family moves Into Town, the farm is nostalgia for the generation who grew up there, and playtime for the generations who didn’t. I have been put on horses to ride with great-grandpa, and I have picked up barn kittens and gotten impossibly muddy wandering in cornfields and checking out ancient, half-buried old cars. 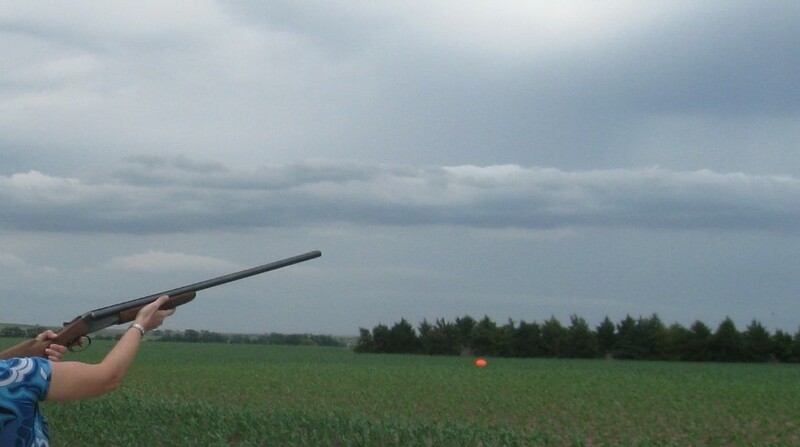 One activity at the maternal family reunion is The Shooting of Clay Pigeons. When I think about guns, I think about my students who have been shot, and neighbors and friends who have had fearful experiences with guns. My only tactile experience with guns was the time I held my brother’s shotgun. He went turkey hunting occasionally with an uncle. I had already heard the safety lesson: always keep your gun pointed straight up or straight down when it’s not pointed at the target field. Now I saw how to unlatch the gun and put yellow cartridges in the closer end, shut it, move the safety from on to off. The first gun I shot had two triggers. The inner one was so close to the end that I wasn’t sure how I could pull it, but my mom’s cousin told me it would go. He was deep down calm, like his legs were a thousand pounds and his resting heart rate was excellent. I wasn’t sure I could shoot a gun, but I’m used to pretending, so I stepped up next to my cousins and uncles, and I put the wooden part against my shoulder. For some reason, I remembered that part was important. On either side of me were some cousins and uncles, looking out at the power lines and six-inch high corn plants. Someone yelled, “Pull!” and several orange flying saucers flew up. I tried to move the trigger, but nothing happened. The trigger was heavy and didn’t want to do anything. The orange discs swirled and fell. As a group, we were not very good. That was encouraging. I waited, and when the next round of targets went up, I pulled my finger back harder. Because people always talk about how loud guns are in real life, and how strong the kickback can be, I was prepared for those two experiences. It wasn’t so loud I felt like I needed earplugs, but then, I only shot six or eight times. It was the force required to pull the trigger. You had to really mean it. I went back to the table where the cartridges were sitting in little cardboard boxes, and handed my gun over to my sister. “You can do it,” I said. Later I got to load and shoot a different gun, a 12 instead of a 20. A 20 caliber, you see, is a “baby gun.” The 12 gauge had a pump on it, so I had that action star moment of “cha ching” when I loaded it. Another one of my mom’s cousins took a turn educating me. I realized how different they are from a gun you’d use to kill a bunch of people. The guns I shot could fire twice, and then someone would have plenty of time to tackle you. Yes, you could kill two people. But then, I have driven a car for many years, and I surely could kill two people with my car. I don’t know if I could hit a possum. My instructor didn’t know who I was, and I had to start that car and drive.